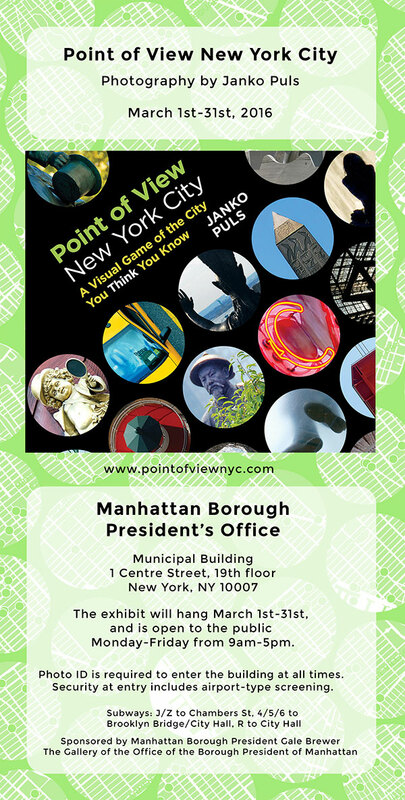 The Gallery of the Borough President of Manhattan, Gale Brewer, is hosting an exhibition of Point of View New York City in March 2016. Next to pictures from the book and other views of New York, the show will feature some small planets from American and European urbanscapes and landscapes. What better place could there be for this show than the 19th floor of the Municipal Building, looming high over the foot of the Brooklyn Bridge, with sweeping views over Lower Manhattan and Brooklyn? So come and join us, the gallery is open to the public. Please see the following flyer with all the important information, otherwise you might not get in!